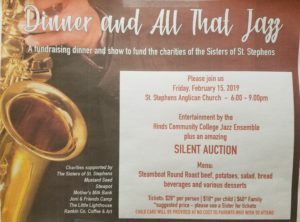 Purchase your ticket for “Dinner and All that Jazz”, a fundraising dinner and show to fund the charities of the Sisters of St. Stephen’s! Featuring entertainment by the Hinds Community College Jazz Ensemble. $20/person|$10/child|$40/family. Child care provided.